Not long ago, Vera Dolo considered herself in need of charity. Less than a year later, she’s the one doling out help to neighbors in need. “These are for any family that cannot buy one,” Dolo says now, pointing to a towering stack of brand new mattresses, each covered in clear plastic. She gestures to a large, nearby pile of recently purchased cooking pots. 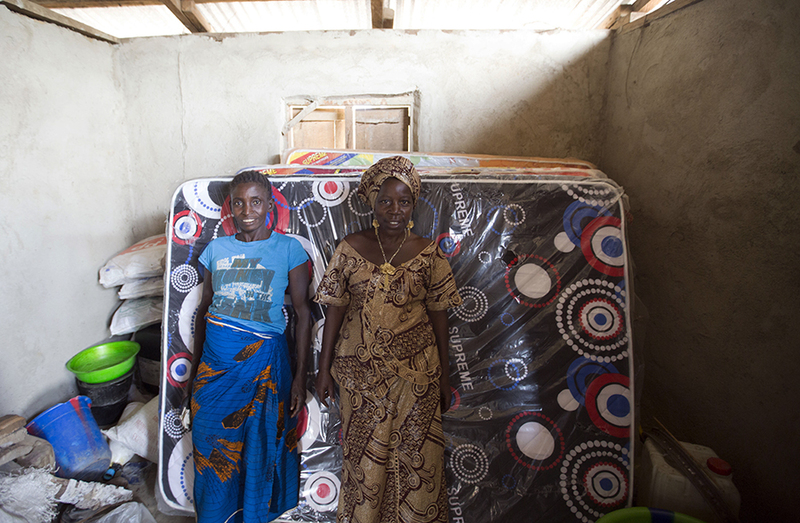 Dolo, right, and another member of her WORTH group show visitors some of the mattresses they've bought for needy families. Things started changing for Dolo last fall, when she joined WORTH, a global Pact program that reduces poverty and empowers women through village banking and entrepreneurship. In Liberia, Pact is implementing WORTH with funding from USAID as part of the FIFES project, which is working to preserve the West African nation’s forests and biodiversity. Through WORTH, Liberian forest communities that once survived by hunting and clearing trees instead are developing alternative livelihoods that don’t destroy forests. In addition to helping the environment here, WORTH is dramatically improving people’s lives. In groups of about 20, WORTH brings women together to save money, access credit and generate income. Members are required to make small savings deposits at weekly meetings, and when groups’ funds grow large enough, members may begin taking loans, which they use to start small businesses. Groups elect officers, receive literacy and numeracy training, and learn business fundamentals. A few months after joining, Dolo took a loan from her WORTH group for 1,000 Liberian dollars, or about US$10. She used it to plant crops. Some of the yield now feeds her family and the rest she sells. Dolo is also learning to read and write through WORTH, and she’s gained new friends and confidence. Dolo gathers for a meeting with other members of her WORTH group. Her group, which has 26 members and chose the name Miamah, or Don’t Listen to Gossip, meets every Saturday. Each week, members are required to deposit 50 Liberian dollars (about US$0.50) into their personal savings accounts, on which they earn interest. The group also collects a small “social fund.” Along with late fees – anyone who isn’t on time for a meeting must pay 5 Liberian dollars – Miamah is using the money to help the community. Besides giving away household items like the mattresses and cooking pots, the group pays for transportation to faraway hospitals for community members who are sick and can’t afford it. 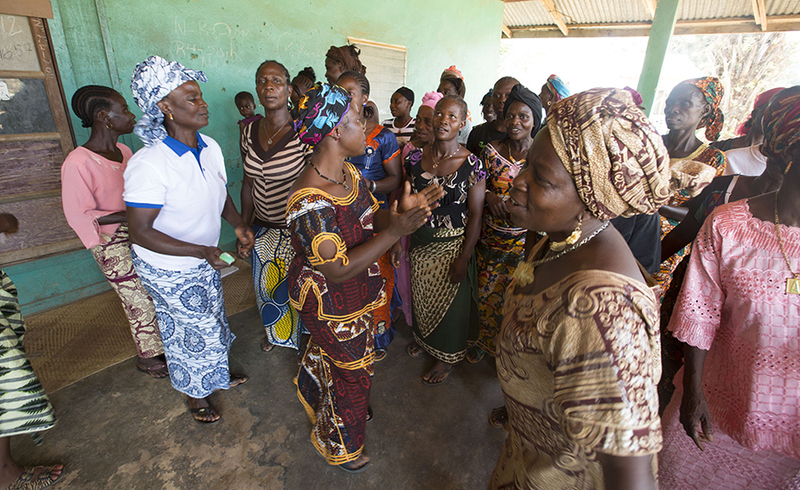 Other WORTH groups in Liberia are using their social funds to support similar causes. Others run collective businesses, such as farms they work together, and use the proceeds to help their communities. The FIFES project (Forest Incomes for Environmental Sustainability) is funded by the U.S. Agency for International Development and implemented by ACDI/VOCA and Pact. The project is conserving biodiversity in Liberia’s community forests by improving forest governance and management capacity, reducing pressure on forests through new economic opportunities and improved agriculture methods, expanding the number of hectares under improved forest management, building local capacity to conduct bio monitoring of forests, and increasing public knowledge about forest conservation and enterprises and the importance of biodiversity.